We all might have to make a similar prayer soon, given the tide of things. Agatha was tortured to death, racked, scourged, burned, her breasts cut off, after what some reports claim to be a miraculously unsuccessful attempt to have her consigned to a brothel. The whole mastectomy aspect of her trial led to her being portrayed in paintings holding her severed breasts, which looked like loaves of bread; hence, Saint Agatha’s bread is – or was – a Sicilian and Italian custom. 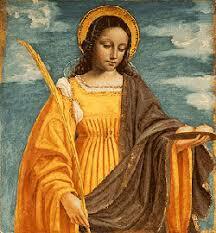 Her martyrdom occurred under the persecution of Emperor Decius, which raged intermittently in the mid-third century. Her life is one of the most historical and authentic of the early saints, testifying to the truth of the barbarity of paganism, a barbarity to which we are so ominously returning. Her name in Greek means ‘good’, the same word that Christ uses when He declares to Martha that Mary has chosen the ‘better’ (agathen) part. We could use a bit more goodness in this world too often apparently blind and even immune to it.